The Russian ambassador to Cyprus repeatedly voiced the position that there should be no outside interferences or imposed time limits in the negotiations over Cyprus or foreign guarantees. In fact, he said that it is unheard of in this day in age for a third country (Turkey) to demand to become the guarantor power of a country (Cyprus) that does not wish to have guarantors. Turkey has an atrocious record over Cyprus, having invaded the island militarily 42 years ago on a pretext, and still occupies 37% of the country. Greece, hoodwinked in 1960 into becoming a guarantor of Cyprus, now refuses to accept the role of guarantor. 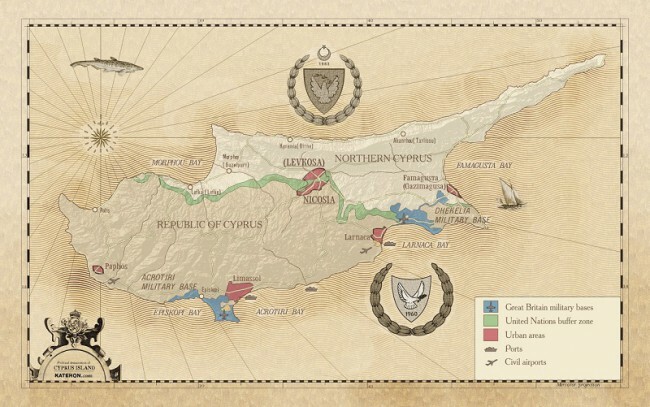 Britain, the third of three guarantor powers since 1960, has military bases on the island, whose area totals 254 square kilometres or 3% of Cyprus territory. Britain does not wish to relinquish its right over these bases, largely because these are useful to NATO and the USA. Her position on the issue of guarantees is cryptic and in effect says that if the other two guarantors agree to relinquish their role, Britain will follow suit. But Britain knows that Turkey will not agree to this, seeing how handy the fig leaf of guarantor can be for Turkey should it ever decide to take over the whole island. Also, with its bases in Cyprus, Britain does not need to be a guarantor to exercise control. Britain, it should be recalled, tried to give up her bases following the 1974 invasion, but succumbed to American pressure, mainly from US Secretary of State Henry Kissinger, not to do so. With a nod from Kissinger, Turkey invaded Cyprus in 1974 and captured 37% of the land and 54% of Cyprus’ shoreline. To this day the US remains silent on the 42-year presence of 40,000 Turkish occupation troops on Cyprus’ soil and the concomitant human rights violations. Greece’s current position is aligned with that of Russia and the people of Cyprus, considering that they do not want to hear about outside guarantees. The Cyprus government pays lip service to the Greco-Russian position but people remain sceptical and distrustful of the official line. Cyprus is a member of the European Union (EU) and the Euro Zone. Turkey has been trying unsuccessfully since 1987 to gain membership of the EU. Turkey’s dismal human rights record, imprisonment of journalists, and its history of coups and counter coups, amongst others, is not endearing her to the EU. As things stand now, the chances of Turkey joining the EU are next to nothing, much to the chagrin of the US and Britain, who want their friend to be inside the club. The people of Cyprus are annoyed with NATO’s silence over the issue of an undemocratic Turkey acting as guarantor of a democratic Cyprus. But the continuing negotiations between the Greek and Turkish representatives in Cyprus provide the best alibi for America not to take a position on this preposterous demand for guarantee arrangements. In the meantime, the British and NATO are capitalising on the presence of British bases on Cyprus and are working behind the scenes to exchange Turkish guarantees for a Turkish-NATO base on Cyprus; a classical case of ‘death by hanging or lethal injection’ for Cyprus. Not surprisingly, a local English language paper in Cyprus, with a long presence but with a tiny circulation (which makes one wonder how it survived financially for so long), is angry with Russia’s support for Cyprus. This paper wrote a few weeks ago that the Russian ambassador to Cyprus should stop encouraging the rejectionists in Cyprus. One presumes that ‘rejectionists’ are all those who do not wish to surrender Cyprus’ sovereignty to Turkey via ‘guarantees’, i.e. the vast majority of the people Cyprus living in the free areas of the Island. The newspaper’s position is shared by a tiny minority of Greek Cypriots who are blindly pro-NATO and by extension anti-Russian. The fact remains of course that the overwhelming majority of the Greeks are friends of Russia and feel heartened every time the Russian ambassador makes his pro-democracy position on Cyprus known. The rhetoric about Cypriots negotiating amongst themselves without interference from outside is of course patent nonsense. In reality, these negotiations are taking place under the threatening presence of 40,000 Turkish occupation troops on the island, poised to intimidate the Greeks into yielding their position. In fact, the Turkish army made its conditions known as early as 1976 and asked the Greeks, ‘to either meet Turkey’s conditions in full or the occupation continues.’ In fact, these negotiations are all about surrender and capitulation, as is typically the case when an occupied weak country negotiates with its much stronger occupier. In reality, the situation for Cyprus is worse than what one imagines, considering that America, Turkey’s staunch supporter, is calling the shots in these negotiations that are masquerading as UN-sponsored. All one has to do is check the CVs of the UN representatives (past and present) in the talks to understand who is behind these negotiations. The irritating thing is that whilst NATO pretends to be the guardian of peace, security and democracy, it looks the other way when security, democracy and freedom are violated with impunity by NATO-member Turkey, whose friendship America so eagerly cultivates, considering Turkey’s strategic position in the area. Whilst America claims that Turkey should not be isolated because of its undemocratic failures and aggression, so as to allow the US to have influence over Turkey, she continues to press EU member-states to isolate and maintain punitive sanctions against Russia. What can one say? In closing, Cyprus needs Russia’s voice now more than ever. Russia has much to gain from its friendship with Cyprus, considering the volatile situation in the Eastern Mediterranean and Russian strategic interests in the region. The overwhelming majority of Cypriots feel safer listening to the supportive and encouraging voice of Russia.